In the eyes of its members, the DMV Chapter is most unique among the Association's established local chapters. The DMV Chapter is not a city-wide group, but more of a regional chapter covering the Northeast region of the United States. Our membership is open to residents of Delaware, Maryland, New Jersey, New York, Pennsylvania, Virginia, and Washington, D.C. It was decided to cover such a wide radius because our Marching 100 Alumni population is thinner in the north than in the southernmost states. The DMV Chapter's intent is to reach out to potential students in the region who are interested in attending our beloved Florida A&M University and participate in music and band programs. As we grow, we will provide financial support to them as well as current students in music and band at FAMU. 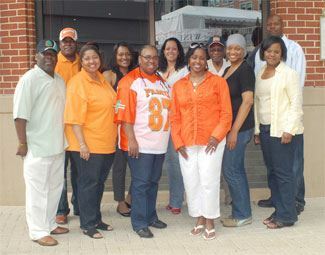 A relationship has already been established with the DC FAMU Alumni Association. We foresee working in collaboration with our fellow Rattlers in D.C. and other areas while fulfilling the purpose of the DMV Chapter.